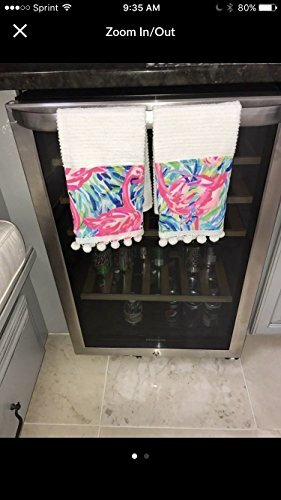 Brand new set of 2 16x19" white cotton kitchen towels made with Pink Flamenco Lilly Pulitzer fabric and pompom trim. Perfect housewarming gift, bridesmaids gift, or just to make you smile in the kitchen. Made by PInk Alligator boutique. *Machinge wash and dry. If you have any questions about this product by Pink Alligator, contact us by completing and submitting the form below. If you are looking for a specif part number, please include it with your message.